What's the score on gender diversity in esports? What’s the score on gender diversity in esports? While esports has been growing slowly but surely over the past two decades and embodying the trappings of other popular physical sports, it’s still not great at tackling the issue of gender diversity. Across most competitive games in the esports domain, male players and teams tend to dominate. For example, at the recent Intel Extreme Masters tournament in Katowice, Poland, Counter-Strike: Global Offensive champions Astralis took home a $250,000 prize; on the other hand, the women’s tournament, which was part of Intel’s AnyKey diversity initiative, saw the winners – Europe’s Team Secret – take home $30,000. It’s worth noting that women aren’t barred from joining teams with males or competing in the larger tournament events – but it’s rare to see them make it past the qualifiers, enter the final rounds and win the big bucks. So clearly, there’s plenty of room for women to grow in this space. I spoke to a bunch of the world’s top female CS:GO players at IEM Katowice to find out what hopes we can harbor for gender diversity in esports in the years to come. Up first is Stephanie “missharvey” Harvey of CLG Gaming. She’s been playing professionally for years, and was also a game designer at Ubisoft Montreal, where she worked on the Far Cry and Prince of Persia franchises. TNW: Speaking to the BBC last year, you mentioned that it’s good to have separate women’s gaming tournaments in order to help female players get into the sport. Can you talk a little more about your thoughts on that? Harvey: Promoting female gaming among women is especially important given that it’s currently dominated by males. I do believe that in five years, the goal is to not have these separate tournaments anymore. But at this point in time, these tournaments allow players and audiences find role models they can relate to. and so it is important for the community for female teams to still exist right now. TNW: What are the factors currently affecting play and competition between male and female players? Harvey: There’s a huge difference in the number of players of each gender. That makes it difficult to find a good female player to team up with. That does help in building good relationships and loyalty, and those are important when it comes to building a good team. At the same time, it also means that there aren’t a lot of options for finding competent teammates you play well with, whereas in men’s teams, it’s a lot easier to switch sides until you’re comfortable. TNW: Do you see any synergy between male and female players yet? Harvey: I was on a team with males for a long while, and I’ve seen more casual players teaming up across genders lately – even more so than all-female teams. But that’s not happening in pro gaming circles yet. TNW: Can you talk about the current state of harassment on the Web that’s aimed at women gamers who want to go pro? Harvey: It’s not the only factor or the biggest one, but it can certainly contribute to pushing women away from it. It can be rough when you’re just starting out, because when you want to be a female pro gamer, you’re just treated differently. TNW: What do you think it’ll take for female esports to reach the next level? Harvey: It’ll take time. 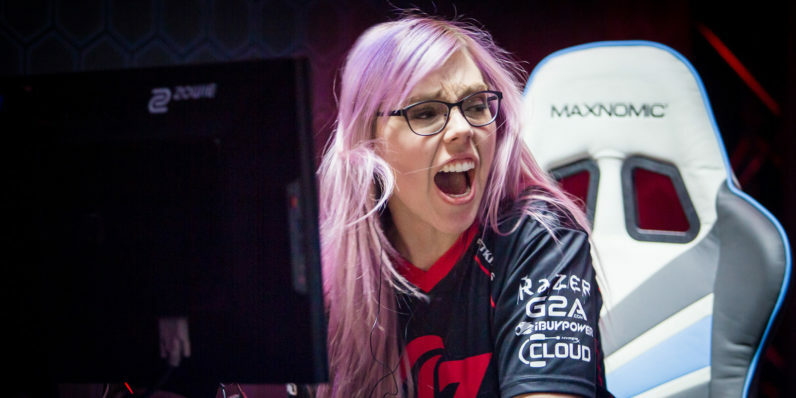 There aren’t enough great female CS:GO players yet; other games like Street Fighter and StarCraft 2 have some terrific female talent though. In a decade, gaming and esports won’t be perceived as entertainment aimed at male children anymore, and the next generation will have many more talented female players. I also think that people who don’t want their kids and especially their daughters to play games have aged and moved on. Today’s young parents have grown up around games or were players themselves. It’s really just a matter of time. TNW: Is there a need for games that are more inclusive in their approach and design? Harvey: A game like Overwatch is pretty similar to CS:GO in the goal and mechanics, but the experience is very different and it accommodates every kind of personality and gender role. More games with that approach will surely help esports more to women. But that’ll take time; you need diversity not just among players but among developers too. When I left Ubisoft, only about 15 percent of the team was female. That needs to change. TNW: You speak to several issues in gaming, while also playing professionally and maintaining a prominent personal brand. Do you find it difficult to do so, given the toxicity of gamers towards women on the Web? Harvey: The initial spark can be easy, but it’s hard for women who have a message to put out there to build a strong following. You can never win, even when you’re only being positive. For example, on Reddit, I’m constantly being bashed in any discussion around gaming; I’m seen as a feminist. However, I’m all for equality and I’m not a supremacist. The online world is negative. But that doesn’t stop me. I just avoid the forums and keep doing my own thing. TNW: Do you see much coverage or user-generated content focusing on the playing techniques and talents of female players? Harvey: There’s zero content like that. I’m thinking about doing that but I haven’t been able to make the time yet. Also, female replays aren’t easily available. We’re the only team that has replays available as we play in male leagues. For instance, in prepping for this tournament, we couldn’t find any replay footage for the european teams we went up against. That obviously makes it impossible to analyze their games. Plus, it makes more sense for most content creators to observe and analyze top-tier teams than lower-ranking ones. I still think it’d be cool to do with women’s teams because it’d be new and it could to an audience that supports or wants to support female teams. The trouble with the idea of holding female-only tournaments is that it could lead to continued segregation and a lack of growth for women players in the long run. But according to some pros, it seems like there’s a bigger benefit to initiatives like this. When I first started playing, I wasn’t very good and so I’d get yelled at, called names. I just kept going regardless and here i am on the second-best North American female team. Having separate tournaments encourages more girls to get into the sport, and gives us more experience competing at a high level so we can shape up to one day compete against the top male teams. It’s more inviting for female players now than before. I’ve been playing for 8 years, 1.5 years professionally and winning tournaments with Secret. Earlier, you’d hear that girls were introduced to gaming by a brother or boyfriend, but now I hear from far more women saying that it’s their female friends who got them into playing and competing. A female friend who was older than me got me into it. Similarly, I reach out to my fans on Twitch to encourage them and offer advice on how they can get better because I do want to see the female gamer scene grow. Separate tournaments help because women can compete without the fear of being talked down to by men. However, with experience, you’ll want to eventually compete against men. For now, it’s necessary as a stepping stone at this point. More coverage about female professional gaming could certainly help encourage more girls to play and eventually compete. I feel that the fact that there are numerous female CS:GO teams out there isn’t common knowledge. While women are keen to see esports become more accommodating for all kinds of players, it seems like it’s not something that will happen overnight. As more parents and children become aware of the sport and find female role models they can look up to over the coming years, we should see a change in the composition of teams and hopefully the dissolving of the boys’ club in esports.